Sir Hugh Myddleton’s New River opened on this day 405 years ago. On Michaelmas Day 1613 itself there was a momentous event. An extravagant parade was led through the streets of Islington and the cheers went up when the first water entered the newly built Round Pond. The New River was a water supply channel built to solve the problem of clean water for London and to help reduce diseases such as cholera – for at the time many of London’s springs and wells were becoming contaminated and diseases were prevalent. Today the water course winds its way through the countryside between New Gauge and Stoke Newington. Four hundred years after it was built it is still supplying London with water. Michaelmas Day 1613, “the flood-gates flew open, the streame ranne gallantly into the cisterne, drummes and trumpets sounding in a triumphall manner.” And the New River began its work. New Gauge in Hertfordshire is the New River’s present source. Its water comes from the Lea. The New River is unique in that barely anything built in the 1600s as a public service utility is found to still be at work four centuries later. In fact Elizabeth 1st was still on the throne and Shakespeare writing his plays when a man by the name of Captain Colthurst went to seek the Queen’s approval for construction of a water supply channel. Elizabeth I died before the paperwork could be approved, however her successor James 1st put his seal of approval on the project, the date being 18th April 1604. It is well known nowadays that Colthurst was the one who originally had the idea for a new river to bring clean water to London. Many claim he actually began work on the New River before running out of money. I have often wondered abut that and have been familiar with the New River for decades. I did quite a bit of research on the New River many years ago even offered to write an article on it for Waterways World. I still have the letter sent in the 1980s in which their editor claimed the New River was no canal of any sort so they did not see the New River as potential material. And if James Brindley had not been the first but the New River instead with so many innovations, the magazine’s editors became even less interested. The original source of the New River at Chadwell Springs. There’s one aspect of the New River that has long been a mystery to me and I decided it was about time it was either confirmed – or completely refuted. This is in regards to the claims Edmund Colthurst buit an early part of the New River in 1604-05. Its said three miles was built by Colthurst but did he really did build this alleged three miles? I have never seen references pointing to the actual work he is said to have done. Further I do not know where others get their information! British History Online does allude to a reference but when I look at the source in question there’s absolutely nothing about Colthurst having done any work. I have also looked at other sources such as that at the Transanctions of the Honourable Society of Cymmrodorion for 1956 and nothing is said there too. In fact the excellent 1956 Cymmrodorion article suggests Colthurst hasn’t built anything and is merely seeking approval to get started. Thames Water’s own book, circa 1990, which the company gave free to anyone wanting a copy, conveys the same impression too. In this Colthurst and his efforts to get the waterway built is mentioned, but it’s also clear he petitioned many organisations. Thames Water insist no construction was undertaken until 1608 when Myddleton was appointed as the project’s overseer. Thames Water’s book – History of the New River. From this we know a survey was done between Amwell and Theobalds Park, but was a waterway actually constructed? Its a good question! Would Colthurst have really built a waterway of several miles length if he was going around trying to get support and approval for it? Even when he got a Royal Assent from James 1st in 1604 there was considerable opposition towards the idea, and then he was trying to petition the City of London and others for further support. It doesnt say he has built or is going to build. It says bringing and brought and in the context of these it means present an idea. The other thing is it says ‘he has a patent’ it doesn’t say he has built a waterway. So what Colthurst is saying is he has a plan to bring a river of water to London and has surveyed three miles of it. Monument at Amwell to Myddleton and a brief description of its purpose. This is the exact problem! Nowhere is there any record of any construction of any sort – or even of people banding together to opposing Colthurst’s work. All the recorded stuff is of Colthurst petitioning and campaigning for his idea to be accepted and made into reality. The other problem is the three miles that is often cited. Its not the three miles we know today. Its actually three old English miles – a mile of which is longer than the mile we use today! It’s about four miles or six and a half kilometres. The location of Amwell itself happens to be a problem of sorts… Yes Amwell is a long way from Theobalds, 12km as has just been said. And no, the village of Great Amwell hasn’t moved either! In those far off days Amwell was a rather larger place and it stretched much further south – thus a good part of Hoddesdon was within Great Amwell. By decree of its diminutive size, Hoddesdon as a small hamlet thus fell within Great Amwell’s jurisdiction. By the 19th Century Hoddesdon had grown in size and pushed Amwell out, except for one remaining bit, known as Great Amwell (detatched.) Until about the 1930s or 1940s there used to be a boundary marker in Hoddesdon’s high street marking where it once became Great Amwell. Victorian daytrippers by the New River at Hoddesdon, probably 1880s. If one starts the measurement of the New River’s course at a point quite level with the old Amwell boundary at Hoddesdon, it just so happens the distance to Theobalds Park is about eight kilometres – or approximately four old english miles. Thus we can see Colthurst probably surveyed a distance somewhere in the order of three old english miles within that section and this would have been reflected on the map stolen from Mr Boothe. Surveying in those days was a little difficult because people were using one of either two methods and sometimes used both. Robert Norden used different values on his 17th Century maps to reflect local measurements and used the old english mile as standard. This in some ways solves the puzzle of that mysterious map for which our Robert Boothe Esq was unfortunately mugged whilst walking through Shoreditch in December 1606. There might have been a conspiracy by the City of London, an attempt to remove from existence any plans Colthurst had done and make his task harder. In my view the ‘Mappe of the new Cutt to bringe the water from Amwell to Tibbolls’ shows Colthurst simply surveyed a possible route and was trying to bring to the attention of others his plans for a water supply channel. These two men, muggers as we must call them, may well have been in the pay of others in order to attack Mr Booth and have him stripped so as to acquire this precious map. Who knows! Further evidence for the non construction of the New River by Colthurst can be found in a petition dated May 1605: “He has a patent for bringing a river of water to London and Westminster from springs out of Herts and Middlesex, and will be enforced to cut through much of Cranborne’s lands. Begs leave to do so at a reasonable rate.” In response to the petition Colthurst is advised to “try the levels before he troubles the country; but he refuses…” Therefore we know he had not built anything to that date. The petitions detail the lands and the owners and the fact he would have to seek their permissions. Clearly much of the land he wanted to build through belonged to wealthy landowners and none of them were going to let him dig a river without their permission. There is another problem. Many people cite that the work cost £700 and thus take this it mean he did build a watercourse of sorts. However in a different record dated to 1605 we are told the work actually cost £200. What could Colthurst had had built for £200? Very little. Thus it quite possibly alludes to the surveying that was done as well as the costs of petitioning. There may have been a initial channel at some location for all we know to show landowners what the course would look. If it had indeed been built from Amwell itself, as indicated in Robert Ward’s book ” Cuttinge the trenche from Chadwell too Amwell, foure foote wyder in the topp & a foote and half wyder in the bottome,” well then it had been built. However there was a dispute abut the dimensions of the waterway and that was one reason for its not being built in the first place. We do know Colthurst was asking people, such as Viscount Cranborne at Theobalds Park for leave to cut a waterway. As we have seen earlier when people challenged him to build a prototype channel, Colthurst refused. Rudden says the legislation for the waterway “appears to enact that nothing can be done until everything can be done.” Although the New River company itself alluded in its own records this is what was implied of the legislation to build the waterway. Rudden says this in fact refers to the River Lea circa 1570. It might have also applied to the New River too for all we know because both waterways covered basically the same areas of countryside north of London. The Lea itself had constant battles over water rights between those wishing to use the navigation and landowners, millers etc, and I am sure anyone building a ‘new river’ right alongside the Lea between Amwell itself and say Hoddesdon, would have no doubt encountered the wrath of those embroiled in that other battle. For that reason alone I do not think Colthurst would have got very far with digging a watercourse. The New River at Rye Common pumping station near St Margaret’s. In the Biographia Britannica: Or, The Lives of the Most Eminent Persons (Volume 5, 1760) it is said “But after several attempts, and long and deliberate consideration, the expence being looked upon as infinite, and the danger and difficulty extreme; the project was in a manner laid aside as impracticable.” Unfortunately we are not told what sort of attempts were made. It seems there is not going to be any clear and definite indication Colthurst built anything, thus at this point we could concur he was the main architect of the project to begin with, but had not constructed any part of it until Myddleton himself entered the fray. The very latest body of work to mention the New River, A Tale of Three Thirsty Cities by Chaim C. Shulman (2017) seems to come to pretty much the same conclusion about any earlier course of water being constructed – Colthurst hadn’t built anything! Shulman: “Though Colthurst personally invested efforts and resources, the project was not implemented for lack of funding.” Exactly. Colthust had the idea originally but it was left to the New River’s outstanding hero, Sir Hugh Myddleton, to find the money, put the idea into practice and build the actual waterway. In a nutshell Colthurst realised any attempt to build the New River would need enormous funding, invoke considerable opposition, and not only that far more land would be required for its course. King James had authorised a channel of limited proportions and it wasnt enough. It too was realised tunnels and aqueducts were needed – in those old far off English days days these things were very much unheard of. Evidently it wasn’t going to be cheap. New powers, extra money and people with better engineering knowledge and insight was badly needed as well as a different route to the one Colthurst originally envisaged, including moving the source further upstream. No doubt Colthurst was the person who conceived the New River, but it was he and Myddleton in partnership who brought the whole shebang into existence. This is why Myddleton was given the right to manage the purse strings. Ultimately the New River busted his coffers. The total expenditure was said to be half a million pounds and he was left quite poor despite King James I stepping in with extra money to help finance the work. In today’s prices the New River would have cost approximately £67 million – but I think it would have been considerably much more than that when today’s surveying, planning, construction, materials, and the technology to be used are taken into consideration. I thought it would be quite interesting to show how the New River (and in fact the former countryside which is now Harringay) looked before the mass sprawl of urbanisation began and the river’s course altered completely. The area around Haringey House was once famous for fishing, boating and leisure walks. The New River encircled the house itself by means of a huge loop. Its impossible to envisage such scenes now. 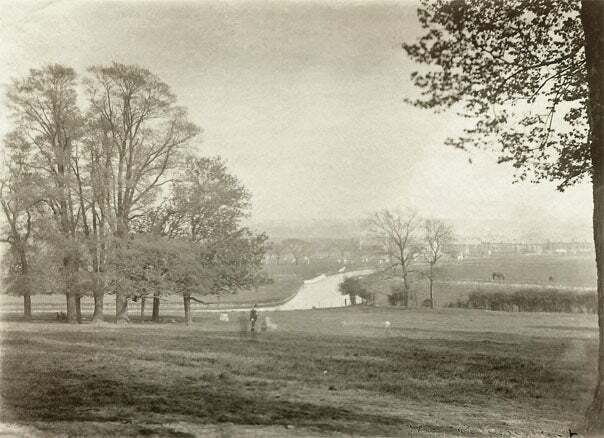 The first picture of the series is taken from a hill upon which Chettle Court now stands. 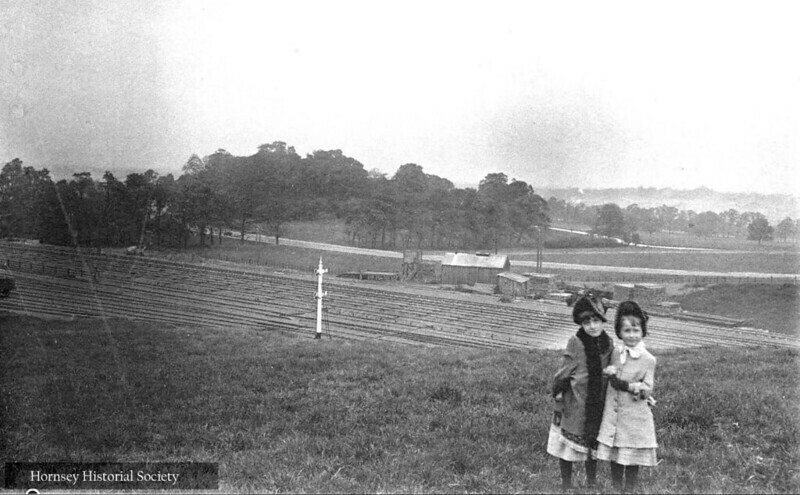 The railway in the foreground is the Great Northern, and the country road beyond is what would eventually become Wightman Road. Set even further back the New River can be seen winding its way along a course that no longer exists. The hill (with many trees) in the distance just beyond what would be Wightman Road, is to the side of where Haringey House, a large country manor, once stood. The next picture below shows a similar view but more to the north with Alexandra Palace visible. 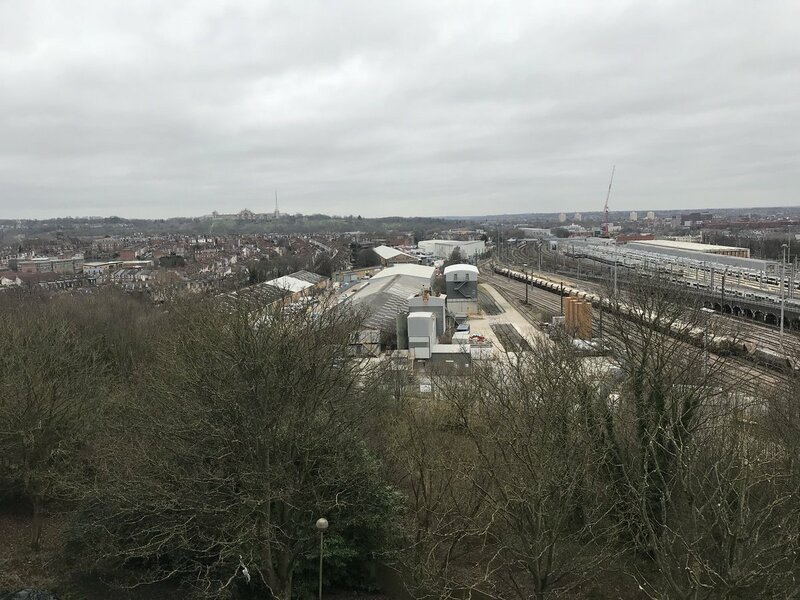 Even though its a somewhat different perspective (I couldnt find one that was exact) we can deduct that Hornsey depot (on the right side of the picture) was built about where the hill levels out to Wightman Road. Evidently there is little trace of the hill these days although there is a bit of trace where Seymour Road is. The bit where Wightman Road drops down then climbs again slightly is still evident today between Pemberton and Seymour Roads. Haringey House was somewhere about where Allison and Beresford Roads meet Wightman Road. This spot would be right on the edge of the modern view. At this point the New River is of course in a cutting below the railway line these days instead of sweeping across open countryside as it once did. The next view (dated c1870) shows the same hill with its clump of trees. It also shows the large pond the New River widened into. It is about at this point the New River these days enters the tunnel leading towards the Harringay Ladder. Thus we have two views of the New River in those days when it ran round the hillsides about what is now Wightman Road. As will be discussed later the entire section of New River was dispensed with by new channel and a tunnel through the hill. I mentioned earlier that the New River is in a cutting these days at this point. Some may wonder how it can end up in a cutting when the levels haven’t changed. The reason is simple. The railway was built on an embankment almost right next to the New River, thus a cutting was effected. Our final picture is of interest too. It looks from the hill we have now seen in two of the previous pictures. This view looks southwards and the land ahead is fields but what would later become part of the Harringay Ladder, with Finsbury Park taking up a bit of land further south. Its not very clear but in the distance is a ridge and that is where Woodberry Down (and the Seven Sisters Road) can be found. Basically the New River’s course was switched to go almost straight under where the photographer stood. I would think this very spot is about where Hewitt Road passes over the course of the New River’s tunnel. Seymour Road would have been built a little further down and at the bottom of the slope would have been about where Warham Road is now. Is there any trace of the old water course these days? I dont think so, however it would have followed a route just to the west of the present Harringay Passage as far as Beresford Road. In the preceding years just before Myddleton became involved, this being 1605 and 1606, the City of London was eyeing the project with some jealousy. Leslie Tomory, writing in The History of the London Water Industry, 1580–1820, shows the City of London had in fact tried to undermine Colthurst’s attempts in order to begin their own project. Remember the unfortunate Mr Boothe? Thus the City approached Parliament for approval of its own plans. The committee of parliamentarians who were given the task of deciding whether to approve the City’s, or Colthurst’s scheme, happened to include Hugh Myddleton, the MP for Denbigh in Wales. Sir Hugh Myddleton’s statue at Islington Green. The statue looks straight down Upper Street to New River Head but the head looks to the right. The New River was actually on the left! The City of London’s fathers knew Myddleton as a person of more repute. He was an investor as well as a Member of Parliament so the City saw him as being the right person to be tasked with the enormous responsibility of financing and building the New River. Colthurst was retained as engineer for the whole project and was given a generous income. Until the 20th Century Colthurst did not have any official recognition of his involvement in the construction of the New River. Most early sources just mention his name in passing. No surprise, many of Islington’s roads are named after Myddleton and the New River. Colthurst – absolutely nothing. In the 1990s when the Stoke Newington filter beds were demolished and a housing estate built in their place, Colthurst’s name was acknowledged for the first time ever. When did the work of building the New River actually begin? Several sources including John Stow insist it was begun on 20th February 1608. Thames Water itself advocates 1608 as the year work began. some say it was May 1609 and others claim it to be later in that year. Bernard Rudden suggests it may have been 3rd March 1609, when Myddleton records his first payments to the labourers who were to dig the waterway. Myddleton too paid mathematician Edward Wright (Fellow of Caius College, Cambridge) Twenty shillings in May 1609 for his three surveys of the route between Amwell and Islington, so it is clear quite a bit of work had been done surveying the possible course, a task which I am sure took quite a few months, remember this is a distance of almost forty miles and the only transport then was by foot or on horseback. Try it! I have said before the New River preceded James Brindley’s use of clay puddling. Many duly credit Brindley with the idea but it seems this was in fact used first on the New River. Thus Brindley’s ‘invention’ was used on the New River an impressive 150 years earlier. The waterway was meant to be opened much earlier than 1613, but there were many problems with the watercourse. Its banks as built were originally very weak, and breaches were occurring. Between July 1612 and March 1613 an extensive programme of rebuilding the sides of the yet unfinished New River involved the use of clay, which was packaged to form a watertight seal. The New River flowed to about this point right by Sadlers Wells from April 1613. See next picture from the 1820s for comparison. Previous Post: CRT’s workboat sinks in Little Venice!